Today, we’re off to Wittenberg Lutherstadt as it now seems to be called everywhere. 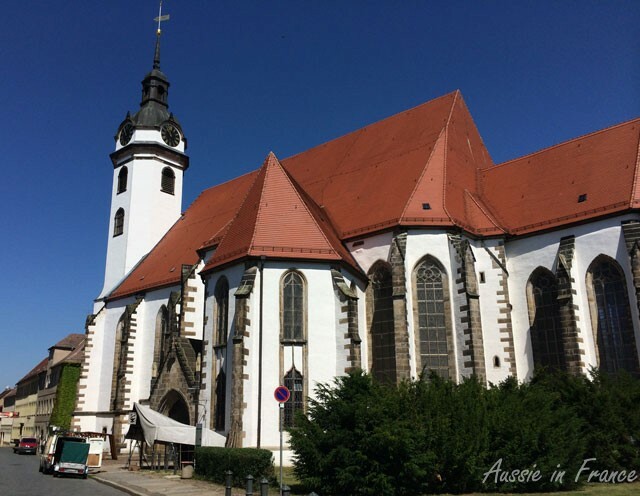 It’s 100 km away and there is only one point of interest in-between – Torgau. We had thought of passing via Leipzig but the photos on google images aren’t very encouraging. We get off to a false start because our Radhaus in Niederlommatzsch doesn’t take Visa card and we have to drive about 10 km to get some cash. Hartenfels Castle was built in 1534. The first thing we see when we approach Torgau is Hartenfels Castle overlooking the Elbe. We park in the shade and put on our straw hats because it is already 28°C in the shade at 11 am! As soon as we walk into the walled town, we see preparations going on. A Renaissance festival like the one we accidentally went to last year in Neuburg on the Danube is obviously in the making. Unfortunately, the castle is undergoing renovation but we walk towards the courtyard which is open to the public. We go across a moat and I look down. What do I see? A brown bear! Poor thing, it looks very hot, even in its pool. 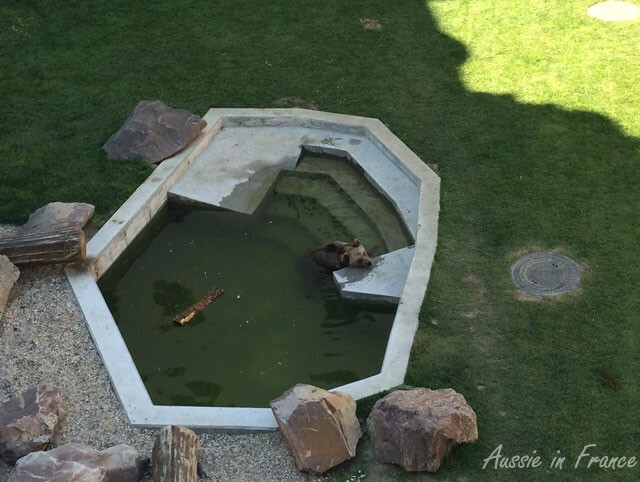 It reminds me of Bern in Switzerland which also has a bear pit. We later see there is a second bear who is also completely flaked out. 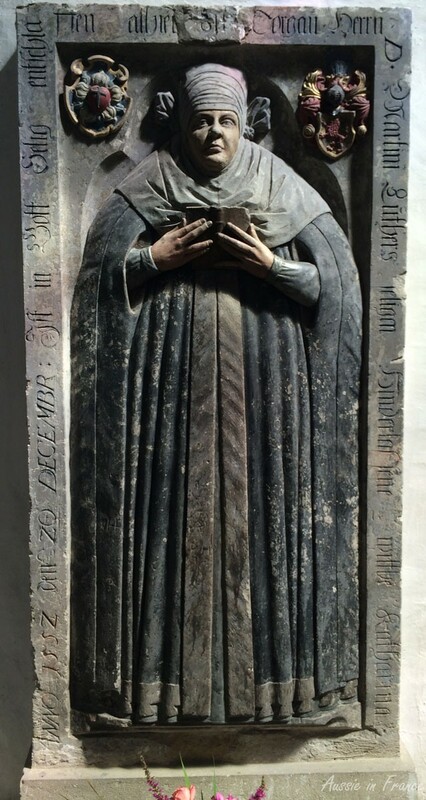 We visit Marienkirche in which there is a mural tombstone of Katharina Luther who died in Torgau. Now that’s an interesting story. Katharina’s parents were of noble birth but had fallen on hard times, so they put her in a convent at the age of 5. When she was 24, she and 11 other nuns escaped from the convent to Wittenberg, encouraged by Martin Luther’s denunciation of convents and monasteries. There she met her future husband, 16 years older than her. They had six children and lived happily ever after. Five hundred years later, there is a Katharina’s Day celebration just for her. 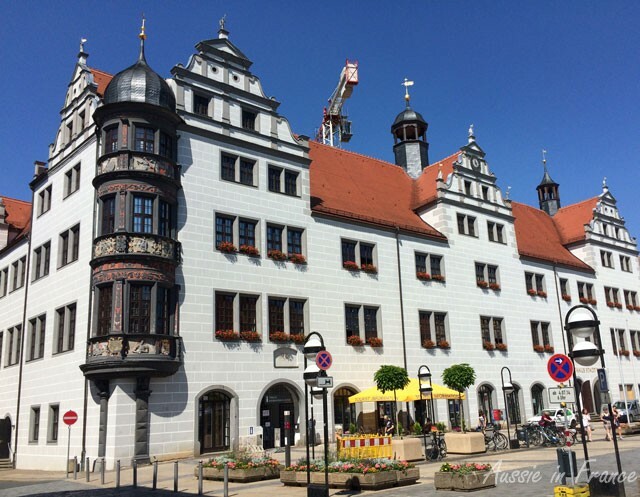 Torgau is a pretty little town with a large market square. A white rathaus takes up most of one side and is flanked by well-retored buildings around the other three sides. There is a lot of renovation going on and it’s obviously trying to capitalise on nearby Wittenberg and the Martin Luther connection. After a nice cold Diet Coke (Coca-Cola Light in German), we continue our route to Wittenburg. Stay tuned. 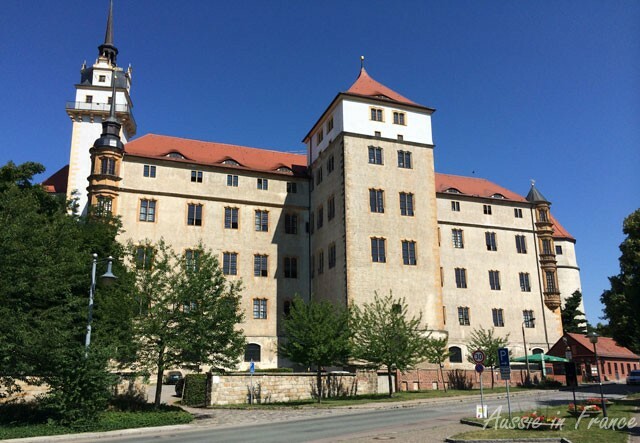 This entry was posted in Architecture, Cycling, Germany, History and tagged bear pits in Germany, H, Hartenfels castle, Katharina Luther, Torgau. Bookmark the permalink. The bear needs something to do- I don’t imagine there’s a lot of space in there. I know, poor bear. There is the moat around the little pool but no forest! That last picture is unbelievable . The architecture is just so stunning . Would have a great view when you see it right before your eyes .